US President Donald Trump and Kim Jong-un, the North Korean leader, will have their second face-to-face meeting today in Vietnam. Donald Trump said Kim Jong Un could soon put North Korea on the fast-track to becoming a major power Sunday as his former rival chugged across China in an armoured train, heading to their highly-anticipated summit in Vietnam. After North Korea's leader began his 4,000-kilometre epic from Pyongyang to Hanoi on Saturday, the US president flies out of Washington on Monday for their second meeting. Images from North Korean state media showed citizens cheering Kim as he waved from the train at the start of what could be a 60-hour journey to the Vietnamese capital. The train crossed the border city of Dandong later Saturday, according to South Korea's Yonhap news agency and the specialist outlet NK News, although the last leg of his journey could be by road. The train's crossing into China follows days of speculation over Kim's travel plans ahead of the talks expected next Wednesday and Thursday. Accompanying the North Korean leader was right-hand man and top general Kim Yong Chol, who met Trump at the White House last month, his sister and close aide Kim Yo Jong, and other high-ranking officials, the official KCNA news agency said. The Vietnam summit is a follow-up to a meeting in Singapore last June which signalled a dramatic reset in relations between two leaders who had been spent previous months sabre-rattling and trading insults. 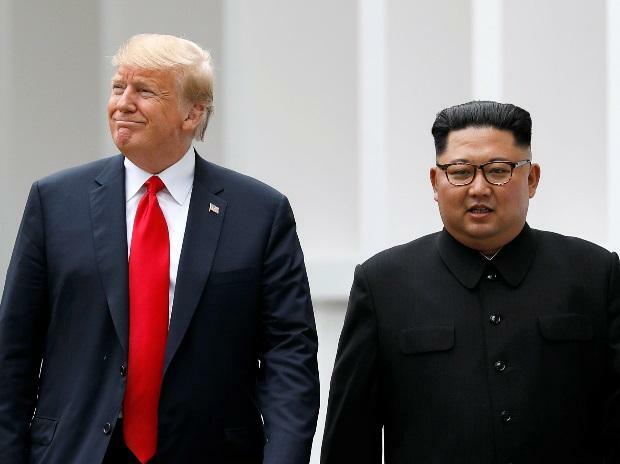 Although that meeting led to little concrete progress in Trump's demands for North Korea to end its nuclear weapons program, the US leader has changed his tune towards a rival he once ridiculed as "rocket man". While his top diplomat Mike Pompeo tempered expectations about what could be achieved in Hanoi, Trump said North Korea could become one of the world's "great economic powers" if it relinquished its nuclear arsenal. "Chairman Kim realizes, perhaps better than anyone else, that without nuclear weapons, his country could fast become one of the great economic powers anywhere in the world," Trump wrote on Twitter. But Pompeo said North Korea remained a nuclear threat and that while internationally-backed sanctions had helped build pressure on persuading North Korea to denuclearise, it was "a complicated process" and there may have to be another summit after Vietnam. "We may not get everything done this week. We hope we'll make a substantial step along the way," he told Fox News. "I hope we can make a real substantive step forward (on denuclearisation) this week. It may not happen but I hope that it will." While Singapore produced a vaguely worded agreement on denuclearisation, progress has since stalled, with the two sides disagreeing over what the agreement meant. Observers say tangible progress is needed in Hanoi to avoid the talks being dismissed as a publicity stunt. Bill Richardson, a former US ambassador to the United Nations and a veteran of negotiations with the North Koreans, feared the summit could be "a dud". "I don't believe it would be a successful summit unless you had some kind of commitment on North Korea's part on denuclearization, dismantling inspections, missiles, nuclear detonations," he told ABC television. "It seems the president is deflating expectations, and that's a concern... I think the president deserves credit for lowering tensions in the region, but in terms of concrete accomplishments, I don't think this summit's going to produce." In his tweets, Trump praised Beijing for falling into line behind the US-led sanctions on Pyongyang, saying Chinese President Xi Jinping had been "very helpful in his support of my meeting" with Kim. "The last thing China wants are large scale nuclear weapons right next door," he added. Kim has met Xi four times in the past year, briefing his country's sole major ally before and after his historic summits with Trump and South Korean President Moon Jae-in. There were no signs of heightened security around Beijing railway station on Sunday, indicating Kim's train likely bypassed the Chinese capital on the nearly 4,000-kilometre (2,500-mile) journey to Vietnam. But Kim, who last met Xi in January, could be saving their next meeting for his return trip to debrief the Chinese leader. Although the exact details of Kim's route remained a tightly-held secret, several sources said Kim was expected to arrive in Vietnam at the Dong Dang station near the China border, then drive to Hanoi. Soldiers were deployed to Dong Dang station and along the road to the capital, according to AFP reporters at the scene. Vietnam has announced that it is closing that 170-kilometre stretch of road for 10 hours on Tuesday while an AFP reporter saw military personnel sweeping for mines along the road. "Vietnam wants to contribute its part to world peace... at this upcoming summit," Vietnamese Prime Minister Xuan Phuc told reporters on Sunday. Rail travel is a family tradition that was started by Kim's grandfather, the North's founder Kim Il Sung, who travelled to Eastern Europe for his longest train ride in 1984. The journey from China's frozen northern border to subtropical Vietnam presents a logistical headache and complex security challenges. Justin Hastings, associate professor in international relations at the University of Sydney, said that would be "a pretty major operation". "They would have to clear the tracks, they would have to provide security for basically the entire length of the Chinese eastern seaboard," he told AFP. But China may view the hassle as a necessary cost to get Kim to the summit. "China wants North Korea to make some steps to denuclearise as much as anyone else," Hastings said.